So yeah, I just completed another Jdorama marathon, this time for the high-profile TBS show, Karei-naru Ichizoku 華麗なる一族. Which, I think, is made to commemorate the station's 55th anniversary. This series is a big-budget, star-studded corporate drama filled with family dysfunction, company politics and political intrigue. It's like those long 60 to 100-episode long TVB Hong Kong drama series like THRESHOLD OF AN ERA, GREED OF MEN or the most recent DRIVE OF LIFE. But thankfully, unlike its Hong Kong counterparts, this series is only 10 episodes long (the finale is 90 minutes, which is the length of two episodes). This drama is set in the late 1960s of Japan. The main rivalry depicted in the series is between Manpyo Daisuke (Kitaoji Kinya), a powerful banker, and his eldest son, Manpyo Teppei (Kimura Takuya), the executive managing director of a steel firm. For some reasons, Daisuke seems to dislike his own son and as Teppei finds out the reason for Daisuke's hatred, his whole life is turned upside down with fatal consequences. While series' focus is on Daisuke and Teppei, it's still very much an ensemble flick. Daisuke has a mistress, Aiko (Suzuki Kyoka), who handles the affairs in the Manpyo household. She's a scheming temptress who exercises more power than even Daisuke's children. Daisuke's official meek old-fashioned wife Yasuko (Harada Mieko) often suffers Daisuke's infidelities and Aiko's scathing insults in silence. Eldest son Teppei married Sanae (Hasegawa Kyoko) in an arranged marriage, but they ended up becoming a loving couple, with Sanae often providing support and encouragement to her husband whenever he's faced with difficulties. Second son Ginpei (Yamamoto Koji), who is favoured by his father, seems perpetually apathetic. Jaded with his father's tyranny and the family's helplessness, he constantly lessens his own pain with sarcastic mockery towards those around him and drowns himself in alcohol. He later marries the free-spirited Makiko (Yamada Yu, pretty hot) in another arranged marriage. The third child is Ichiko (Kazue Fukishi, whose poster I removed from a hotel wall in Japan many years ago to keep for myself), whose husband, the shady Mima Wataru (Nakamura Toru, was in HK films like TOKYO RAIDERS and GEN X COPS) is a dude who often does dirty spying work for his father-in-law. Wataru and Manaka are also a result of an arranged marriage by Aiko. Wataru seems interested in Aiko, constantly flirting with her when they have their private meetings. Youngest child Futako (Aibu Saki) secretly goes out with Yoshihiko (Narimiya Hiroki, the lead in the IMA AI NI YUKIMASU series) an employee of Teppei's factory. 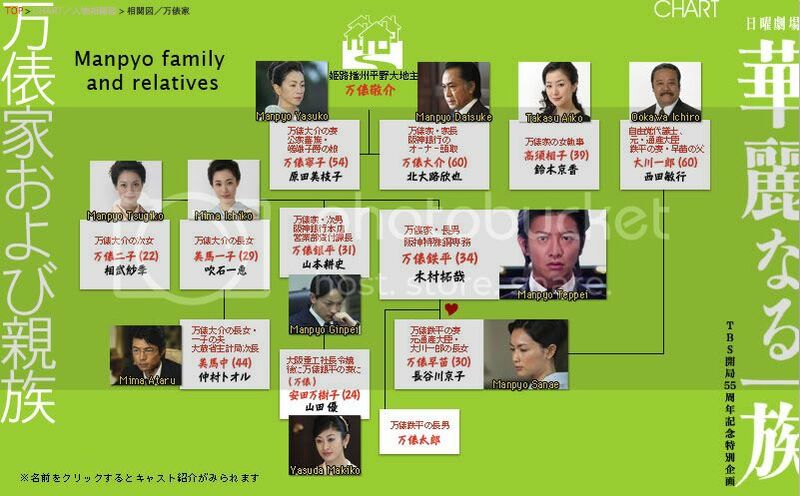 Go check out the MANPYO FAMILY CHART. This is the most spectacular looking J-dorama I've ever seen, and being a guy who had been watching J-doramas for nearly a decade, I'm not exaggerating. Directors Fukuzawa Katsuo and Yamamuro Daisuke made the series very cinematic. The mise-en-scene is of such a high standard that many times I felt that the small screen does not do some scenes justice and that they should be shown on big screen instead. The scenery of the majestic snowy mountains, and the sets, costumes and cars that bring us back to 1960s Japan, eye-poppingly awesome production values, man. Maybe it's because I've not been exposed to big-budget Jdoramas like this, or this is really the first of its kind, where good production values are coupled with good filmmaking and great acting, hence delivering such a wonderful experience. The few Jdoramas I watched before this, like H2 (reviewed here), or the earlier Takuya Kimura series ENGINE felt much inconsequential and fluffy (though I did enjoy them immensely!) compared to the heavy stuff in this dorama. It's engaging to watch, but it's almost difficult to go through more than 2 episodes at once because I needed to catch a breather and digest the intense stuff I subjected myself to. As I've mentioned before, this series is masterfully-acted, there isn't a single weak performance in the series, but there are lots of GREAT performance in it. Takuya Kimura, Kitaoji Kinya and Suzuki Kyoka's performances are the most-acclaimed in the series, earning them the BEST ACTOR, BEST SUPPORTING ACTOR and BEST SUPPORTING ACTRESS at the Japanese TV Academy Awards earlier this year. Deservingly, I believe. I've been watching most of Kimura's doramas since LONG VACATION and I think this is absolutely one of the best performances in his career (... er, yes, better than his glorified cameo in Wong Kar Wai's 2046 :P). But man, WHO is Kitaoji Kinya? The guy is the MOST badass-looking old dude ever. Dripping with menace and class, Daisuke is the most complex character in the series. Sometimes you hate him for his ruthlessness, yet occasionally, you feel his pain, and believe that some decisions he made DO hurt himself as much as others. As for Suzuki Kyoko, her role is definitely one of those roles you'll love to hate. Everytime I saw her insult any one of the Manpyo family members (and she does that a lot), I shake my head in disbelief, remarking how harsh or cold, she is. However, I personally was impressed by Yamamoto Koji's performance as the conflicted Ginpei, whose apathy hides a quiet grief and self-loathing for his and his family's plight. Constantly living in both his elder brother and his father's shadow, Ginpei finds himself nothing more than a pawn in a huge political chess and makes mocking statements about it all the time. I was first introduced to Yamamoto Koji in the classic dorama series Hitotsu Yane no Shita 1 & 2 (Under the same roof 1 and 2) , in which he was much younger, and played this disabled teenager, and already back then, he was fabulous (some of the finest and most affecting scenes of that series were with him), then I saw him again earlier this year in the horrible Ai Otsuka vehicle TOKYO FRIENDS (review here), which I went "eh? Isn't he the kid in the wheelchair in UNDER THE SAME ROOF?". The finale is quite a downer, and is almost unacceptable when I watched it just now, but gradually, everything just made sense and I just said to myself: "this is the best closure for the series, there's really no other better way to end this story". Besides, the series IS based on a novel anyway.